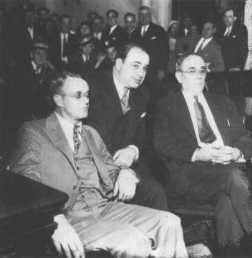 The U.S. Treasury Department had been developing evidence on tax evasion charges - in addition to Al Capone, his brother Ralph "Bottles" Capone, Jake "Greasy Thumb" Guzik, Frank Nitti and other mobsters were subjects of tax evasion charges. On June 16, 1931, Al Capone pled guilty to tax evasion and prohibition charges. He then boasted to the press that he had struck a deal for a two-and-one-half year sentence, but the presiding judge informed him he, the judge, was not bound by any deal. Capone then changed his plea to not guilty. 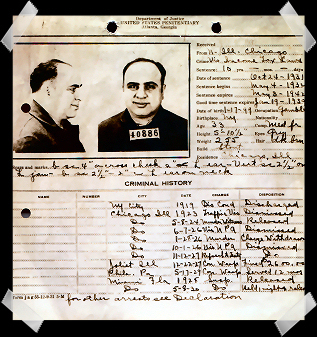 On October 18, 1931, Capone was convicted after trial, and on November 24, was sentenced to eleven years in Federal prison, fined $50,000 and charged $7,692 for court costs, in addition to $215,000 plus interest due on back taxes. The six-month Contempt of Court sentence was to be served concurrently. Al Capone pled guilty to tax evasion and prohibition charges. He then boasted to the press that he had struck a deal for a two-and-one-half year sentence, but the presiding judge informed him he, the judge, was not bound by any deal. Capone then changed his plea to not guilty. 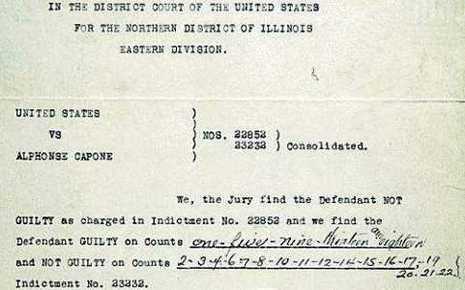 While awaiting the results of appeals, Capone was confined to the Cook County Jail. 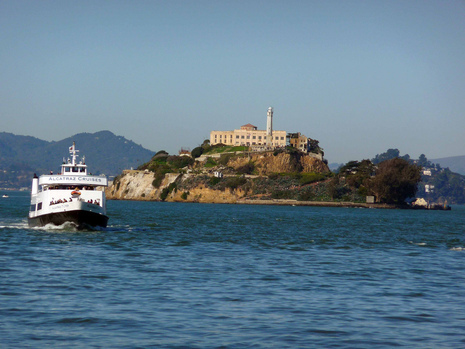 Upon denial of appeals, he entered the U.S. Penitentiary at Atlanta, serving his sentence there and at Alcatraz. In 1929, Prohibition Bureau agent Eliot Ness began a successful investigation of Capone and his business. Shutting down many breweries and speakeasies Capone owned, Ness brought down his empire slowly. To lie low, Capone arranged to have himself jailed in a comfortable cell at Philadelphia's Eastern State Penitentiary for nine months beginning August 1929. Upon his return to Chicago, he quickly found himself in the legal quagmire that effectively removed him from power. In 1931 Capone was indicted for income tax evasion and various violations of the Volstead Act. Facing overwhelming evidence, his attorneys made a plea deal, but the presiding judge warned he might not follow the sentencing recommendation from the prosecution, so Capone withdrew his plea of guilty. Attempting to bribe and intimidate the potential jurors, his plan was discovered by Ness' men. The jury pool was then switched with one from another case, and Capone was stymied. Following a long trial, he was found guilty on some income tax evasion counts (the Volstead Act violations were dropped). The judge gave him an eleven-year sentence along with heavy fines, and liens were filed against his various properties. His appeal was denied. In May 1932, Capone was sent to Atlanta U.S. Penitentiary, a tough federal prison, but he was able to obtain special privileges. 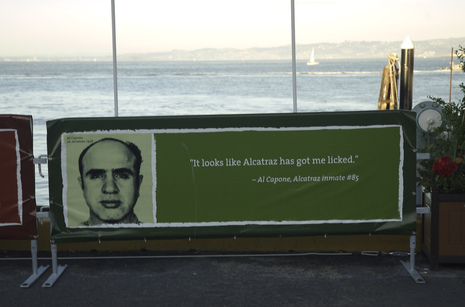 He was then transferred to Alcatraz, where tight security and an uncompromising warden ensured that Capone had no contact with the outside world. 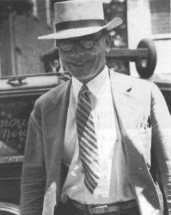 His isolation from his associates and the repeal of Prohibition in January 1933, precipitously diminished his power. Capone earned the contempt of many inmates when he refused to take part in a prisoners' strike after a sick inmate was denied medical treatment and died. Continuing his work in the prison laundry, Capone was continually harassed by other prisoners and often called a "scab" or "rat." When Capone attempted to bribe guards he was sent to solitary confinement. Capone suffered further harassment and unsuccessful attempts on his life throughout his prison sentence, including spiking his coffee with lye and an attack as he was walking to the dentist's office. Though he adjusted relatively well to his new environment, his health declined as the syphilis he caught as a youth progressed. Antibiotics to cure the disease had not yet been discovered. He spent the last year of his sentence in the prison hospital, confused and disoriented. 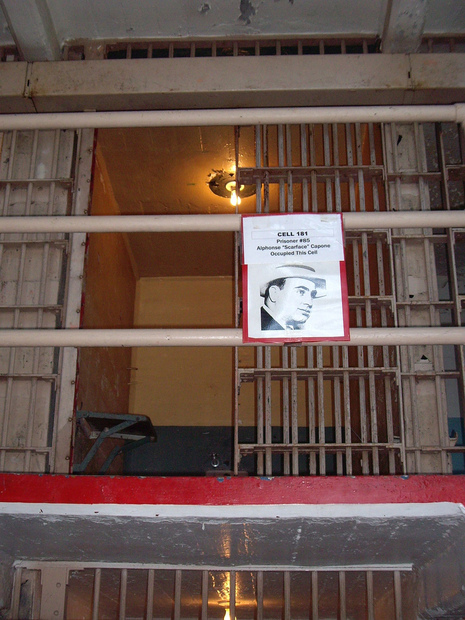 Capone completed his term in Alcatraz on January 6, 1939, and was transferred to the Federal Correctional Institution at Terminal Island in California, to serve his one-year misdemeanor sentence. He was paroled on November 16, 1939, spent a short time in a hospital, then returned to his home in Palm Island, Florida.